Mud Is A very good Indie with star power. It's time for Matthew McConaughey to step up and do what he does best and in Mud he nails the role. The cool little Indie has all the trappings of a good film including, a taught plot, good direction and a couple of kids that can act to boot. If you like movies that ease into the plot and hook you before you know it, rush out to see Mud. 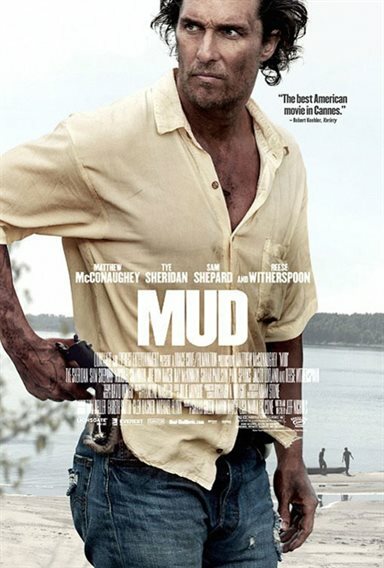 The movie spins a yarn about a wanted man named Mud (Matthew McConaughey) who holds up on an island off the edge of the Arkansas River. Two young boys, Ellis (Tye Sheridan) and his friend Neckbone (Jacob Lofland), discover Mud living in a boat that's stuck up in a tree as the result of a recent flood. The two boys had found the boat on an earlier trip so they aren't too happy to see Mud. When the inquisitive youngsters hear Mud's story of why he's there and for whom he's waiting they set out on an adventure to help him find his one true love. The coming of age film gives a bit of a twist on the Romeo and Juliet theme of forbidden love and in this story writer and director Jeff Nichols puts together a hellacious set of misfortunes. Mud is part romance and a lot of manipulative mystery with some nicely placed action scenes. What makes this movie a standout however, is the acting by McConaughey portraying a manipulative character who entices the young boys to do his bidding. He's a hero to the boys in an awkward time of their lives, especially Ellis, whose hormones have run amok over an older girl at his school and we find him playing out Mud's obsession on a different playing field. The movie has two excellent youngsters that shine as Ellis and Neckbone putting good energy into their characters. Ty Sheridan has a lot of screen power and looks comfortable in the role as Ellis who takes the lead in the two boy's adventure. Not many youngsters can capture a role opposite McConaughey and steal his thunder, but Sheridan does it a couple of times in Mud. Lofland reminds me of a young River Phoenix when he made his film debut in Stand By Me and if he stays this good he should do well in the business. The two youngsters have excellent screen presence, ability to control their characters and offer a lot for future directors. Writer/director Jeff Nichols has already made himself known in the industry with winning Indies Shotgun Stories and Take Shelter both starring Michael Shannon. Here he makes McConaughey his main guy showing a man with a weakness that's out of control. Nichols molds McConaughey into Mud (sorry for the pun), a hero to the two boys and yet with a flaw in the form of an obsession. He just can't come to grips with his love for Juniper (Reese Witherspoon) a woman who lives on the edge that's just out of his reach. I admire his performance here creating the kind of appealing character that he does best (A Time to Kill, Sahara, and Lincoln Lawyer). Mud has been rated PG-13 for some violence, sexual references, language, thematic elements and smoking . Download Mud from the iTunes Store in Digial HD. For more information about Mud visit the FlickDirect Movie Database.